The City Views series will continue soon, but I haven’t yet fully decided what to do next with it. In the meantime, here’s another older photo which I had not shared before, fitting perfectly into the Leineweberstrasse series. 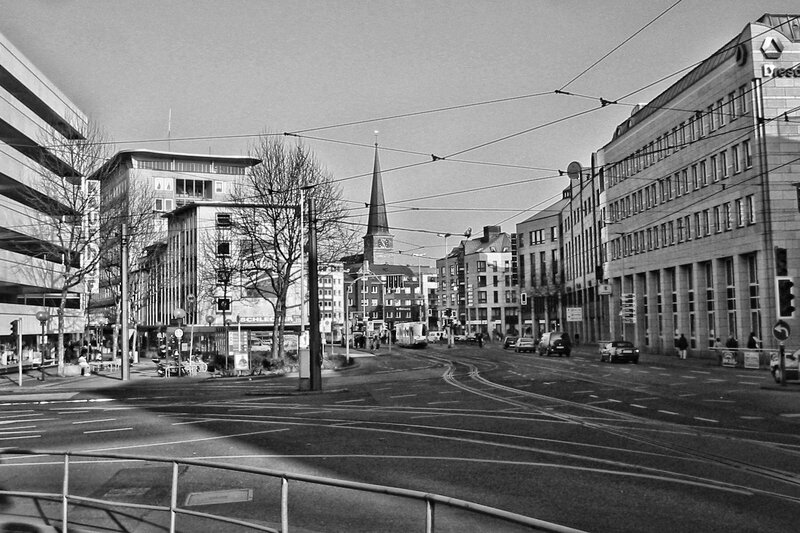 This is actually the short span of the street between the Berliner Platz crossing and the Schloßbrücke. On the right is the actual Berliner Platz with its bank buildings, in the middle you can see the Petrikirche on the church hill rising over the city and the building with the curiously-shaped roof is also very noticeable. On the far left is part of the car park from the now-abandoned Kaufhof department store. Only about 50 meters or so behind me in this shot is the bridge going over the river – maybe that’s where I’ll be taking the series next, I’ve got some great shots of Schloß Broich in the archives! This photo is from March 2003, one of the first ones I had taken with my very first digital camera, a Canon Powershot A200 – this is why it looks a bit grainy and digital.